Located in Seminyak, only few steps away to boutiques, art galleries, restaurants, bars and beach. 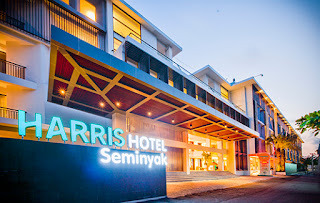 HARRIS Seminyak offers 231 rooms, meeting rooms, HARRIS Café, HARRISSIMO Pizza, Juice bar, Fitness center, Swimming pool, H’Spa, Happy Feet Reflexology, Dino Kid’s Clu­b and boutique. Last but not least, Internet is free throughout the hotel’s premises. We, at HARRIS Seminyak, look forward to welcoming you in Bali. HARRIS Seminyak Hotel is seeking talented people and offer them the opportunity to grow. Mention clearly on the email “Subject” the position (Name - Position Applied).